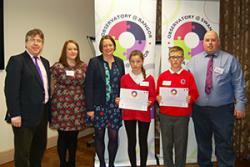 Pupils from Ysgol Biwmares presented their research. Here, with Prof Dermot Cahill, Helen Dale and Arwyn Roberts, who ran the Little Voices Project, and Children's Commissioner, Prof Sally Holland.School pupils from three primary schools across north Wales (Beaumaris Primary School, Southdown Primary School, Buckley and Hiraddug Primary, Dyserth) were invited by Bangor University’s Law School to formally launch their report "Lleisiau Bach Yn Galw Allan / Little Voices Shouting Out" (17th November). This is the first time the United Nations Committee on the Rights of the Child has received a report drawn up by 7-11, based on their own research. Researchers from Bangor University (Arwyn Roberts) and Swansea University (Helen Dale) worked with schools across Wales to prepare the report, in the Big Lottery sponsored project. The pupils will present their school research projects carried out by them as part of "Lleisiau Bach Yn Galw Allan / Little Voices Shouting Out". As part of their agreement to follow the UN Convention on the Rights of the Child (UNCRC), the Welsh Government are required to report to the United Nations on how they safeuard children and their rights. The report was based on over 700 responses from schools across Wales in response to a questionnaire designed by children in 12 schools. The questionnaire asked Welsh children about their rights to health, education, play, environment, information and where they live. The children look at the results of a questionnaire and gave their comments. "Lleisiau Bach Yn Galw Allan / Little Voices Shouting Out" staff synthesised the ideas and responses to compile the report. Pupils from Southdown School, Buckley shared their research on homelesness.This report has highlighted a lack of awareness of the UNCRC / UNCRC. The report also noted that children aged 7-11 should have a greater voice in the community and should have access to age-appropriate news and information, sometimes they receive too much information. 97% of children think smoking should be banned in playgrounds / parks. The schools also have the opportunity to examine a topic of their own choice in detail with support Little Voices. Two of these will be presented at the meeting. Pupils at Ysgol Beaumaris wanted to investigate opportunities for PE at school. The group worked with the Head to have structured games at break times Ysgol Hiraddug investigated how to improve the use of their local mountain, Moel Hiraddug, as a leisure resource for the community.and to have games equipment available in the hall during wet weather. Pupils at Southdown School, Buckley chose to find out about homelessness. The group learnt about the situation for young homeless people in the area a representative of the Wrexham Night Shelter. They held an awareness day at school and raised money and collected toiletries for the young people there. Ysgol Hiraddug pupils explored extending the use made of their local mountain, Moel Hiraddug. 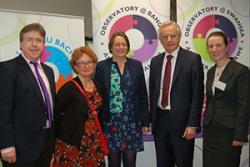 The event formed part of the Launch of Observatory@Bangor, at Bangor Law School. This will be the North Wales branch of the Wales Observatory on the Human Rights of Children and Young People, which was founded at Swansea Law School in 2012. 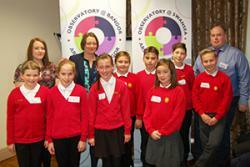 The Observatory is a collaborative project with international, national and local partners. It provides a forum for research, debate, education and knowledge exchange on human rights of children and young people, working for realisation of human rights through policy, practice, advocacy and law reform. 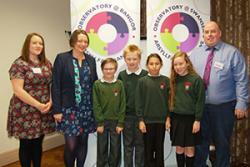 The Children’s Commissioner for Wales, Professor Sally Holland, will launch the Observatory@Bangor, at an event taking place in the Reichel building from 12-2pm on 17 November. Should you like to attend, please contact Dr. Yvonne McDermott Rees: y.mcdermott@bangor.ac.uk for further information.